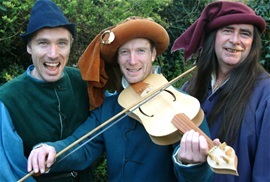 Singer Jeremy Avis (left) and multi-instrumentalist Giles Lewin (centre) appear with Tim at Alfriston Charter 600 Celebrations (9 June 2006). From lusty dances and drinking songs to the haunted airs of the troubadors, Swyndelstock evokes the turbulent reality of mediaeval life. Drawing on a pool of musicians skilled on lute, fiddle, bagpipes, hurdy gurdy, pipe & tabor and more, Swyndelstock appears in different combinations. The band takes its name from the famous Swyndelstock tavern, which flourished at the heart of mediaeval Oxford from about AD 1250 to the late 17th century. Named after the wooden swinging part of a flax flail , the rowdy tavern stood on Carfax, the crossroads in the city centre, and saw the outbreak of the city's most notorious town vs gown riot. On l0th February (St Scholastica's Day) 1355, a party of scholars drinking in the tavern complained about the quality of the wine. The taverner replied with 'stubborn and saucy language', and the scholars 'broke his head with a flagon'. The wine-merchant rallied the townsfolk, and in three days of mayhem pitched battles ensued.